Raffle Bingo is just $20! The 10 Colorball Games pay $100 each and 12 Speedball games pay $50 for each game. Support your club and give it a try. You will enjoy it! Raffle Bingo on the 1st & 3rd Wednesday of each month at 6:30 PM. 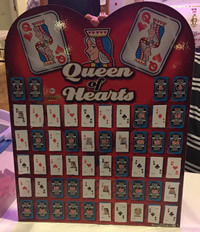 QUEEN OF HEARTS LAST WEEK WAS $20,500.00 Dont forget your ticket for this weeks drawing. $1 is all it takes. Drawings are every Friday at 8:30 PM and you dont have to be here to be a winner. REGULAR BINGO: 6:30 PM every Tuesday. Team 5 Don’t have one when we have 5 Tuesdays in the month we sometimes struggle! Tickets are $1 each or 6 tickets for $5. Drawings are every Friday at 8:30 PM. KARAOKE Immediately following the drawing.